Endovascular Interventional Neuroradiology is comprised of selected papers from the prestigious Stonwin Medical Conference, which each summer invites a group of internationally prominent neuroscientists, bioengineers, neurosurgeons, and radiologists to explore and discuss selected topics of neurosurgical investigation. 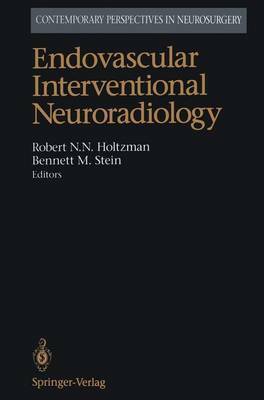 This volume addresses recent advances in endovascular approaches to cerebral circulation, including: Surgical exposure of the superior ophthalmic vein in the management of carotid cavernous fistulas at Johns Hopkins; Current and future perspectives in interventional neuroradiology at New York University; Interventional neuroradiology; Principles of endovascular neurosurgery: N.N. Burdenko Neurosurgical Institute; Intravascular embolization of craniocerebral vascular diseases: Beijing Neurosurgical Institute; and more.